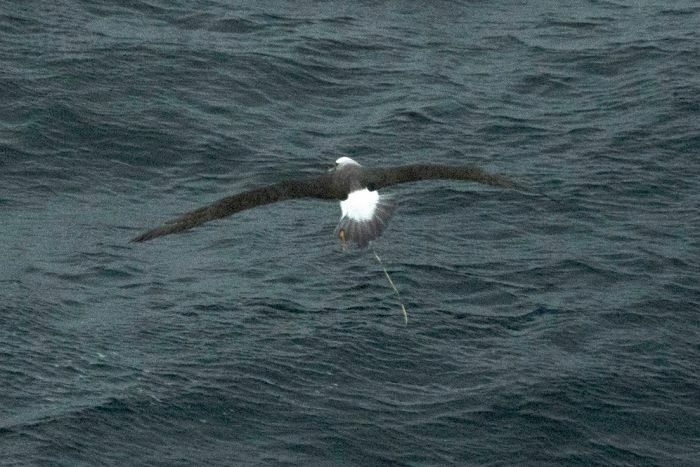 Scientists have discovered birds eating a party balloon and playing with a plastic bottle, as well as finding a soft drink can 1,000 metres under the sea while on a voyage off Tasmania’s coast. The researchers saw the “heartbreaking” scenes onboard the CSIRO vessel RV Investigator on a trip to explore underwater mountains. On Saturday, researchers were nearly 100 kilometres out to sea when they saw birds interacting with the plastic waste. Marine biologist Alice Forrest said it looked like the bird was having a snack. “We thought it had a squid in its mouth and upon closer observation we realised that what we thought was a squid with tentacles was a rubber balloon with a string trailing from its mouth,” she said. “It’s heartbreaking to see, especially somewhere like this where we’re so far from people, somewhere that looks so untouched. 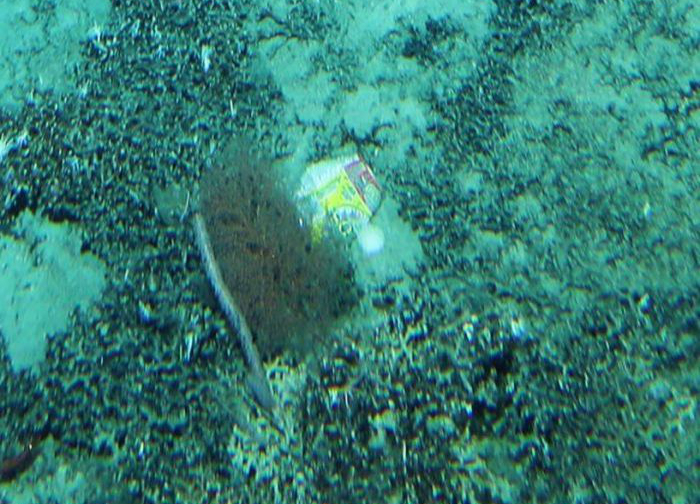 A crushed soft drink can was seen on the ocean floor at a depth of 1,000 metres. 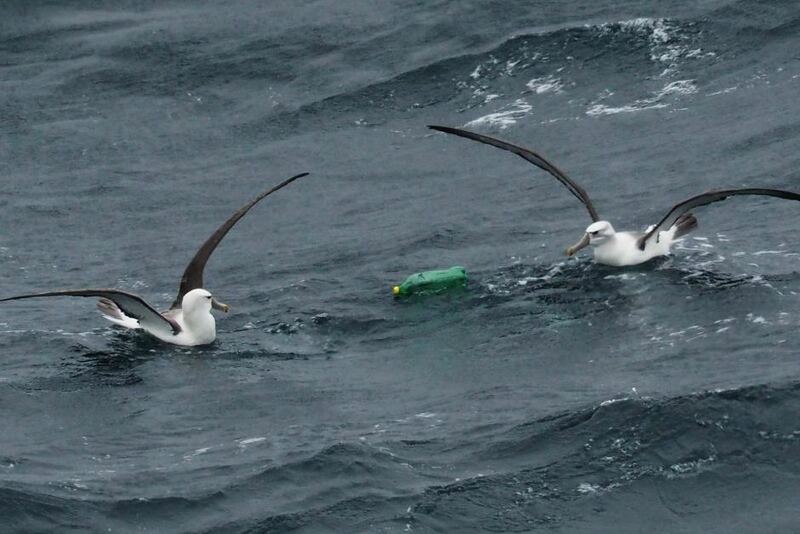 On the same day, the scientists saw a group of albatrosses investigating a plastic bottle. “They’re very curious birds and they were all gathered around it and one of the birds was picking the plastic bottle up and throwing it around,” she said. Scientists on board the vessel also found a soft drink can 1,000 metres below the ocean’s surface amongst soft coral. Eric Woehler from BirdLife Tasmania said the problem was getting worse. “It’s disconcerting to see this sort of interaction — and to see both of them on the same day,” he said. 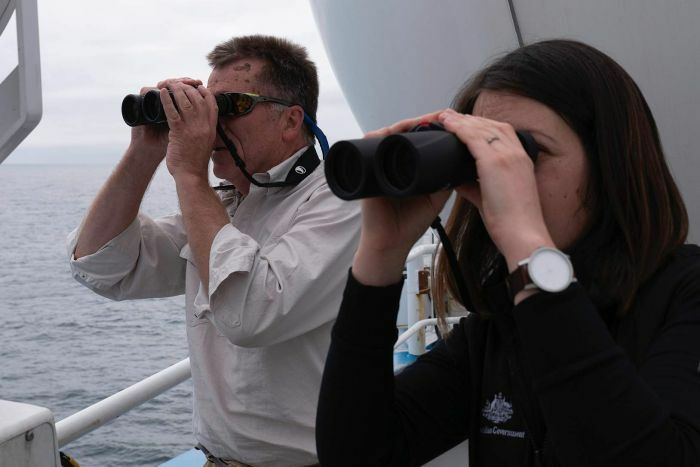 Dr Eric Woehler, with Parks Australia’s Cassie Layton, observing birdlife on board CSIRO research vessel Investigator. Dr Woehler said it was not the first time he had seen party balloons at sea, after researchers discovered two groups of balloons hundreds of kilometres off the coast of New South Wales in September. “It’s affecting every marine species in the marine environment,” he said. This article originally appeared on ABC News online. People continue to celebrate events with hundreds of helium filled balloons being released. The information concerning dangers to animals by their doing so is not being read. It may be that there are not that many readers, even in developed countries. Perhaps global newscast corporations need to make quarterly announcements/stories with photos such as the one you have with the albatross and dangling string from eating a balloon which will clog its intestines and cause death. These images reflect the serious implications of every society’s attitude to, not only discarding of waste into the environment, but unthinking generating of waste and the consequences. The same can be said for energy waste, food waste and other natural resource waste. Humans appear to gain a short-term advantage by the technology associated with this subsequent waste. But in all these areas of waste, THE losers, because of our incessant poor behaviour, maybe greed but certainly short-term thinking in our comfort zone, will be us humans. There is no point looking disjointedly at all these issues (environmental pollution, climate change, desertification, species loss, habitat loss, water shortages etc.) without first changing (educating and awareness) our attitudes generally and taking responsibility and seeking a more knowledgeable way of living without absolute consumption and easy discarding of so-called plentiful resources. Its time to make change before we ‘drown’ ourselves. We should all reflect on our interactions with the earth and its natural resources. I was extremely shocked when, on a recent river cruise on the Irrawaddy in Burma, I saw that the villagers treated their plastic food wrappings just as they always did when they were made of banana or woven coconut leaves. They throw it all on the river bank and wait for it to be washed away into the sea! I think that here and similar places is where rapid re-education needs to take place.